Firstly, check the dimensions, and it you are not very good at visualizing things, ask for a 3D drawing and make sure you pace out the space. When home owners Jason and Pauline were renovating their home, they realized as building progressed that there was not only nowhere for a bin in the kitchen, but there was no pantry either. 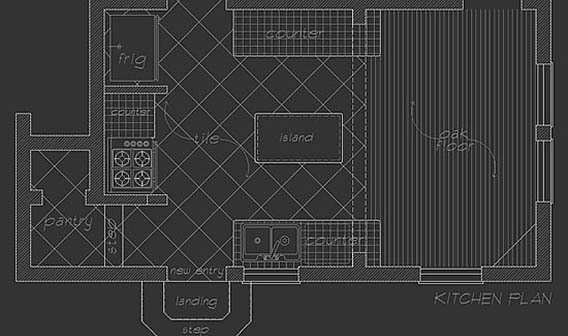 The plans just showed a simple U shaped kitchen. They say that one of the most difficult things about their renovation was trying to visualize thing that didn’t exist. With only one flat set of architect’s drawings, they felt they “never had any idea how things would look, despite their many visits to kitchen and other showrooms. In the end, they had to redesign the kitchen as they went, leading to more variations with the builder. The other key thing to bear in mind is the time it will take to complete the job and the sequence of steps – particularly if you are arranging other tradespeople like the plumber and the electrician. In addition, while your choice of finishes can drive up the cost, it can also affect the time it takes to build the kitchen. Removing the old kitchen’s cabinets and appliances, electrical wiring and plumbing disconnected and pipes and electrical relocated ready for new kitchen – one day. If you choose a laminated benchtop and a tiled splash back, then the benchtop is usually finished off at the same time as the cabinets are installed. However, if you choose granite, for example, then you’ll typically need to allow eight to ten days. Glass splash backs are likely to take another two weeks or so, because the glazier normally arrives after the benchtop is installed to create a template. Depending on the structural work to be done, you could be without your kitchen for up to 6 weeks. However, with a well-organized kitchen company,the duration can be much shorter. PLEASE NOTE: This is just a general checklist and does not replace the installation requirements of individual manufacturers. What’s behind the splashback and what’s under the floor? Consider using Villaboard® Lining behind the splashback and Scyon Secura wet area flooring under the tiles. Both Villaboard Lining and Secura wet area flooring are resistant to damage from moisture. That’s because James Hardie® fibre cement and Scyon products are homogenously resistant to moisture damage, which means that even if the material does get wet, it won’t deform or lose its structural integrity, like many other materials. you have written about are similar to where I come from. Thanks for sharing this information.